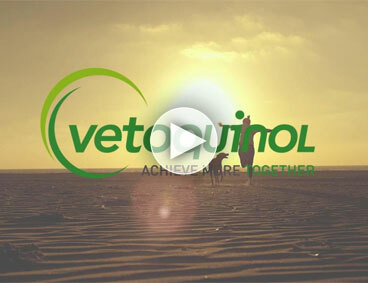 The 9th largest veterinary pharmaceutical company in the world, Vetoquinol is first and foremost an independent, family-owned business.Deeply committed to its values, it has always enjoyed a close relationship with its vet clients. Our brand new veterinarian-dedicated interface detailed here. Step-by-step protocols and techniques for employees responsible for the cleaning and disinfection of animal care facilities. Discover our supplement line for performance horses! AllerG-3 is formulated with omega-3 fatty acids to improve skin and coat condition in dogs and cats and to support kidney and heart function. BNP combines triple antibiotic spectrum for the treatment of conjunctivitis in cats and dogs. BNPH has all the benefits of BNP, with added hydrocotisone acetate to provide rapid relief of eye irritation and photophobia. Bioestrovet is an analogue of prostaglandin F2α to induce luteolysis in cattle. Bioestrovet can also be used to manipulate the estrous cycle. Ceftiocyl is indicated for the treatment of bovine respiratory disease (BRD). FerroForte: injectable iron for the prevention and treatment of iron-deficiency anemia in newborn piglets. Fertiline is a gonadorelin acetate sterile injectable solution developed for cattle. Fertiline is Canada’s best selling GnRH. Equine Super Diet is an equine vitamin and mineral supplement. Make sure your horses have what they need with Equine Super Diet. Nutrequin® Classic Formula is a vitamin and mineral supplement in an apple-flavoured, wheat-germ meal base for performance and breeding horses. Nutrequin® Elite is a vitamin and mineral supplement for performance horses. Zylkene® Equine, a natural nutritional supplement with calming properties, without any sedative side effects. It is developed for horses and contains alpha-S1 tryptic casein. FastDraw: a 2nd-generation anticoagulant rodenticide, formulated with the lowest concentration of the newest active ingredient, which is undetectable by rats and mice. Hombre: a 2nd-generation anticoagulant rodenticide, formulated with the lowest concentration of the newest active ingredient, which is undetectable by rats and mice.